If you have roses, you have bug problems. Roses must be delicious as it seems that every garden bug has a vested interested in taking at least one bite out a rose bush. Plant Spray is a quick and easy fix for aphids and other creepy crawlies. Although you can certainly buy your own plant spray, making your own is just as easy and much, much cheaper. Back in the 1980s, I was an avid fan of Rodale Press. They have been publishing books and magazines on organic gardening since 1942. I was concerned about the amount of chemicals making their way into my food and wanted to grow food that my grandmother would be proud of. The biggest trick seemed to be building healthy soil while putting the right plant in the right place. For the most part, I have done this. Then there are roses. I do not have the proper amount of sun access for roses. The places that do have full sun are reserved for my vegetable patch. I have roses that battle for light under the shade of plane trees and a monstrous walnut tree. Yet they bloom. Around late spring to early summer, the aphids hit them. I do what I can to to fortify the soil but the aphids don’t seem to mind. They just chew away. I have ladybugs. I encourage aphid eating chickadees to visit my garden. I prune the roses judiciously but the aphids still nibble away. The recipe below was based on a formula from an organic gardening book by Rodale Press my mother had. I copied it down on a piece of notebook paper and tried it out when I got home. I have used it so many times that I don’t have or need the recipe. I have since refined the recipe and don’t think it bears much resemblance to the original version any more. Yet my gratitude to the Rodale Institute is bountiful. Mugwort is a natural bug repellent which doubles as an anti-fungal agent. 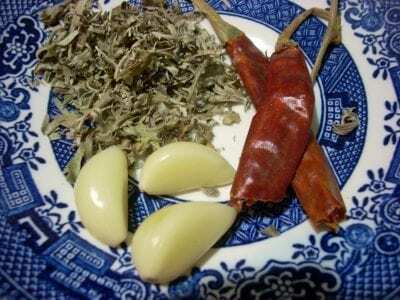 The chili and garlic are common organic plant spray ingredients. Many formulas on the internet today also include onion but I find onions to be too starchy and clog my spray bottles. I have, over the years, learned that the extra garlic combined with the addition of the mugwort works just as well. This formula also works on whiteflies and mites. Do not use it on people or animals. It will burn horribly. The cayenne when hot, will fill the air with capsaicin which burns the eyes so keep a lid on the saucepan while the water is hot. Safety first. Remember that birds do not have receptors for hot pepper which makes this a wildlife safe recipe. Do not spray it on mammals. This is plant spray only. 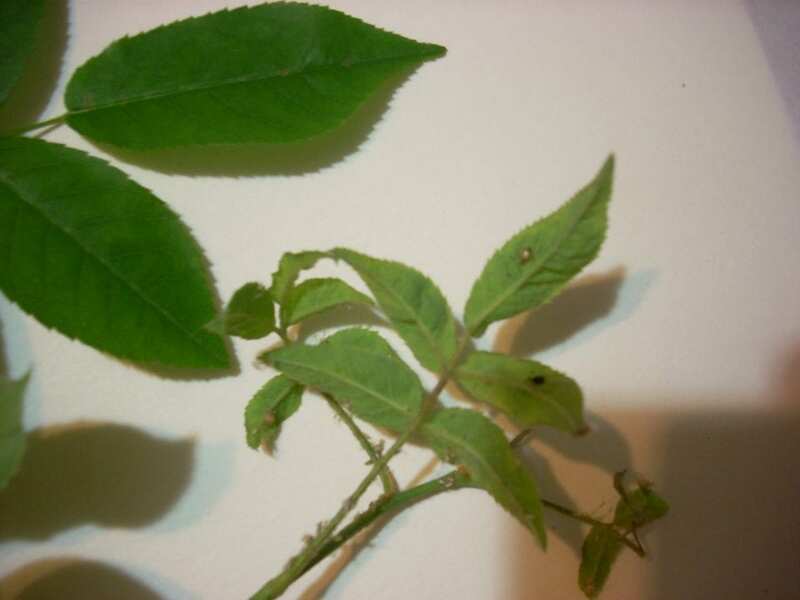 It will deter animal interest (like deer) for a short time after it is sprayed on the plant. Bring 1 quart of water to a boil in saucepan. Put herbs in boiling water and cover with lid immediately. Reduce heat to low, simmering herbs for 5 minutes. Take saucepan from stove and let cool. DO NOT remove lid. When saucepan is cool to the touch, remove lid. Strain infused water through a filter into quart jar. Gently stir in dish soap. Transfer formula to a clean spray bottle. Clearly mark your spray bottle and remaining formula and off you go! 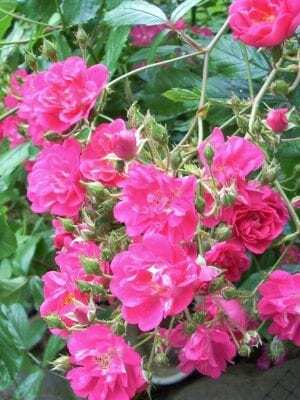 This plant formula is designed to cover about 4 large climbing roses. Mark the spray bottle and dedicate it to plant spray. Do not reuse bottle. Wear waterproof gloves and eye protection. Spray the underside of affected plants throughly. Store plant spray in the refridgerator for no more than 1 month.